Mr MoaB had a rare Saturday off and after a lazy morning we really wanted to get out for the afternoon. I remembered that I had seen a Play in the Park advertised in Thame which isn't too far from us, so we decided to go along. 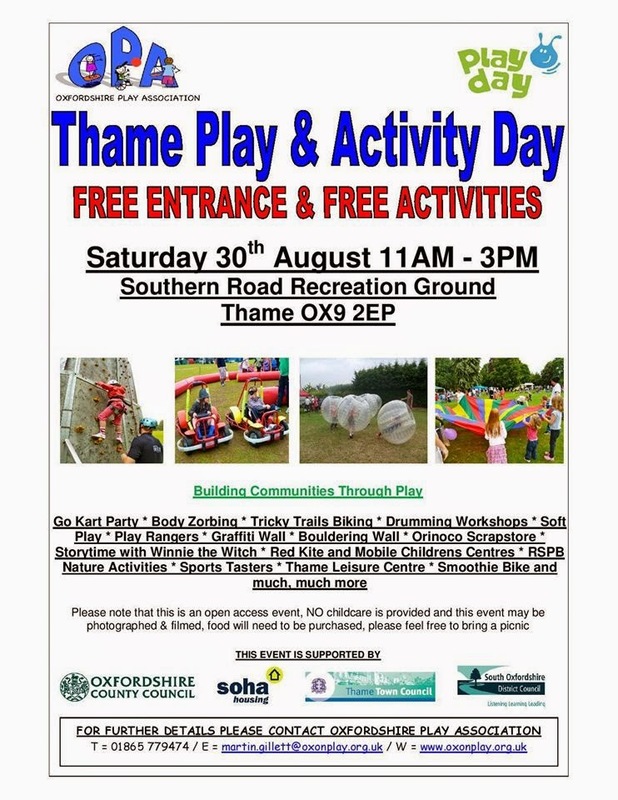 This Thame Play & Activity Day was organised by the Oxfordshire Play Association. The first thing as we came into the park was a soft play area. It was shoes off for Little Miss A so that she could start playing straight away. Down the mini slide, on the bouncy animals and into the ball pool. After a good play, we managed to persuade her that there was more to see. She loves climbing things so liked the idea of the boulder wall, but of course needed a lot of help from Daddy! We then came across a mud kitchen set-up by one of the children's centres'. Little Miss A's nursery report always says that she's been playing in the kitchen area so this mud kitchen was great for her. Soil, dried pasta, oats etc. could all be mixed together in lots of different pots & pans before being 'cooked' into the oven!! A highlight of the afternoon was watching Little Miss A join in a Drumming Workshop. She was having a great time banging away! For the older kids there were go karts, body zorbing and a bouldering wall amongst other things. So a real variety. We passed a big Graffiti Wall that all the kids during the day had drawn on. It looked brilliant! The final thing that we explored was the Community Bus. Downstairs they were offering crafts and upstairs there were loads and loads of toys. It's amazing what you can fit into a converted bus! The event was starting to wind down and people were packing away so there was just time for another quick play in the soft play area before we headed into Thame town centre for a coffee. I can't believe how much at this event was actually free. At most of the other play days we've been to this summer there have been free activities but then lots has still had a small charge such as the Bouncy Castles etc. The only thing I could see that you had to pay for was the food and refreshments! Really glad that we went along to this. Will keep an eye out for other events organised by the OPA!